From about the late-1970's through to the mid-1990's - the use of polybutylene pipes was a very common replacement for copper pipes. These pipes were installed in millions of homes throughout the United States. So, if you're purchasing (or have purchased) a home built during that time frame - you may want to check if your home still is outfitted with polybutylene pipes. Polybutylene is made of a plastic resin material which made it cheap, flexible and freeze resistant. This seemed like a superior product to copper pipes. You see, copper pipes tend to corrode over time. The copper in the material begins to slowly dissolve and leak into the water running through it. They are also very vulnerable to freezing and bursting which means they end up causing major leak problems. And finally, copper pipes inevitably begin to scale (create a buildup of deposits inside the pipe). These deposits, very much like the copper begins to seep into your water and the scaling decreases the flow of water through the pipes. It seemed logical to begin using a "superior" product in plumbing, which at the time was considered to be Polybutylene. But, in time, these polybutylene pipes began failing simply due to the oxidants of flouoride and chlorine that are in our public water supply. The pipes began bursting and leaking. Homeowners across the country began replacing their plumbing pipes with CPVC pipes, which is today's optimal product for plumbing. So, how do you know if you have this pipe material in your home? 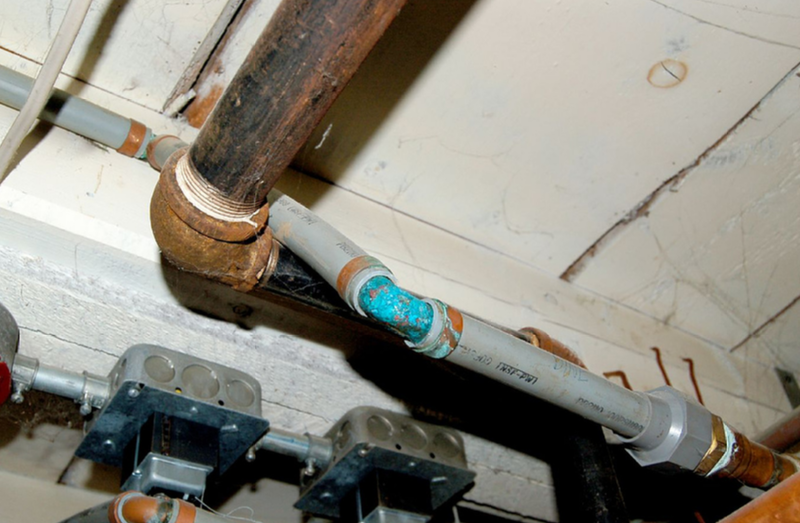 There are basically 4 ways that you can identify polybutylene pipes. 1) Color - Polybutylene pipes are normally Blue, Silvery Gray or Black in color. Normally, the blue pipes were used outdoors, and the other two colors were used for indoor plumbing. 2) Stamp With The Letters PB - Most of the polybutylene pipes that were manufactured were stamped with the letter "PB" followed by a string of numbers. If you can see your pipes, you can check for this stamp. 3) Check The Main Water Shut-Off Valve - Outdoor polybutylene pipes were often installed near the main water shut-off valve - so you can check that area for the blue pipes. Indoors - if you have a drop down ceiling in your basement you can then check the pipes there for the Silvery Gray or Black pipes. You may also find polybutylene pipes near water heaters. 4) Expose The Pipes In Your Home - If you are in the midst of a re-construction and have the opportunity to remove drywall or panels around sinks, showers, tubs and toilets then you will have a great opportunity to check to see if your home is plumbed with polybutylene. If you have any questions about Polybutylene pipes - call the experts at Atlantis Plumbing today at 770-505-8570.